March 22, 2010 | By Patrick | Filed in: Geek, PAS. My iPod Touch was *sniff* a good friend. Until last weekend. 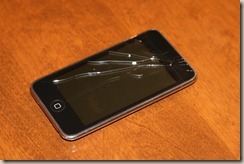 I stupidly slipped my iPod into my back pocket before the UW hockey game and it, as you can see, cracked mercilessly. I had done it a hundred times before with no repercussions. No biggie, right? I discovered it when I got home and immediately my mind went to figuring out what to do next. Back to the issue at hand. I remember recently seeing a video of someone replacing the screen on an iPhone and, while difficult, it was doable and relatively cheap. The down side was that it was time-intensive. 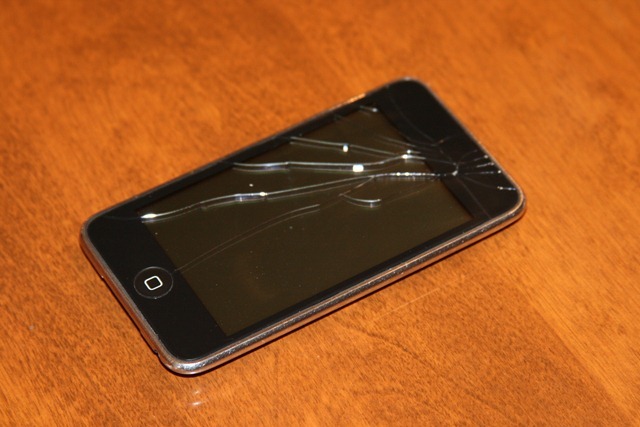 It would take a few days to receive the replacement screen plus a day or more to do the fix. And it might not be successful. Or I’ll snap something during the process and be back at square one. I have other mp3 players (no iPods) that I could use in the interim, but they wouldn’t be as smooth. My experience has been that an iPod Touch or iPhone are by far the best listening devices. I don’t need more hoops to jump through, so I decided to replace the iPod immediately and try to salvage the old one anyway. After finding a replacement kit on Amazon for $15, I ordered it, received it, and it’s waiting for the operation. I’ll try to capture some video of the process and post it a bit later. Wish me luck.